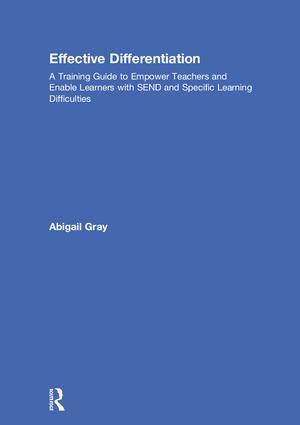 Chapter One: What do I know about Special Educational Needs Disability and inclusive teaching? Chapter Two; What about a baseline? Chapter Four: What are 'core deficits'? Chapter Five: What is multi-sensory teaching? Chapter Six: Who are Dr Gopta and Mr Chuffi? Chapter Seven: How can I work most effectively with Teaching Assistants? Chapter Eight: How do I share good practice? Chapter Nine: How do I implement change? Abigail Gray has more than 20 years of experience in SEN, as a specialist teacher, SEN co-ordinator (SENCO) and school leader. She now works both as a private SEND consultant and trainer for her own company, Senworks Ltd, and as an Achievement Coach for the educational charity Achievement for All.